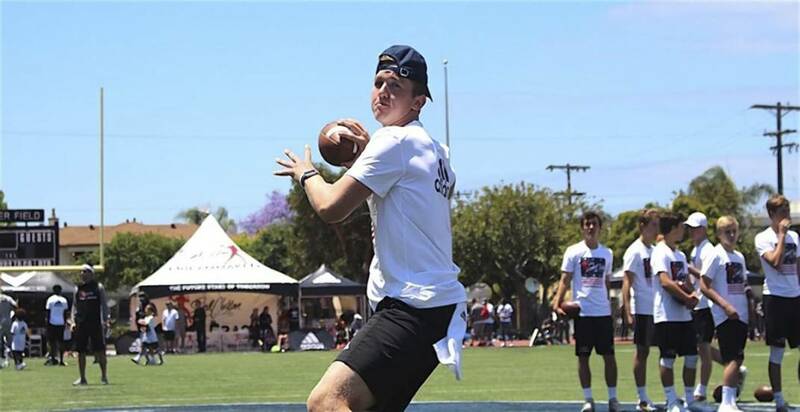 Four-star quarterback Harrison Bailey of Marietta, Georgia, is among Tennessee's early commitments for the 2020 recruiting cycle. The month of January continued to be a very busy one in college football recruiting. It's just for the next cycle. "We are well into the 2020 and 2021 classes," Georgia coach Kirby Smart said last week. "We spent the entire month of January getting close to 2020 kids." The 2019 recruiting cycle marked the second one containing a 72-hour signing period during the middle of December in addition to the traditional date on the first Wednesday in February. Many college coaches expected the early signing period to have a profound impact, which it certainly has, as 72 percent of prospects who signed with Football Bowl Subdivision schools during last year's cycle chose to do so in December, with that bumping up to 76 percent this time around. It was even more extreme with Southeastern Conference programs, as 91.7 percent of Georgia's newest class signed early, with Tennessee at 90.5 percent and Alabama at 88.9 percent. With having so many kids now signed before Christmas, SEC coaches are using January as a race to the future. "The recruiting calendar has changed a lot of things," Tennessee's Jeremy Pruitt said. "It's moved the timetable up, so you start recruiting ahead and planning ahead. I think it's important how you finish a class, because you've got to hit your number, and I think that we were able to do that. "I'm excited about the guys we've got coming in, and I'm excited about looking forward to this next class." Pruitt just wrapped up his first full recruiting cycle with the Volunteers, landing a class that has two five-star offensive tackles (Wanya Morris and Darnell Wright) and is No. 12 in the 247Sports.com team rankings. That the Vols have been in 2020 mode since the start of the year reflects that Pruitt no longer appears to be playing catch-up, even though he's still essentially 14 months into his job. The early period certainly aided Alabama in the recent cycle, as Nick Saban's Crimson Tide signed 24 of their 27 newcomers before the significant staff turnover that has resulted in seven new assistants. "Mostly what we did in January was really about next year's recruiting — the 2020 class," Saban said. "Two of the three we signed in this last period had been committed to us before, so the coaches did a good job of keeping those guys in the fold." Five days before this year's traditional signing date, Saban was in Chattanooga visiting McCallie School and 2020 defensive end prospect Jay Hardy. The change in college's recruiting calendar has affected high school coaches as well. New East Hamilton coach Grant Reynolds spent the past three seasons at Madison (Alabama) Academy, which produced a pair of former All-SEC performers in Vanderbilt receiver Jordan Matthews and Auburn running back Kerryon Johnson. Reynolds likes the early signing period overall but admits it has produced a new time of stress for his players. "There is a lot more pressure on you in that December time frame with coaches coming in the door," Reynolds said. "These kids are having to think about this stuff as they're finishing out a season, which makes it a lot different from before. We had a lot of different coaches in our building in early December, whereas before it wasn't nearly as hectic. "Because of that, there is not the same rush that there was during the last few days of the signing period in early February. It alleviates some of that pressure, and I don't mind that one bit." Alabama had the nation's No. 1 signing class for the 2019 cycle and leads the 247Sports team rankings for 2020 as well. The Crimson Tide already have 10 commitments, highlighted by five-star weakside defensive end Chris Braswell of Baltimore. LSU finished with the No. 5 class this past week and is ranked No. 2 so far in the 2020 cycle with nine commitments, headed by five-star cornerback Elias Ricks of Santa Ana, California. Four-star quarterback Harrison Bailey from the Atlanta suburb of Marietta headlines Tennessee's four 2020 commitments, with five-star offensive tackle Broderick Jones from the Atlanta suburb of Lithonia topping Georgia's early crop of three. "It's definitely changed what we all do in January," Saban said. "If we're only recruiting a handful of guys — we may have been recruiting eight or 10 guys in the last few days to get three or four — you're spending most of your time going and looking at juniors and next year's class. So this becomes a little bit more like spring recruiting, even though you can't evaluate the players other than in the weightroom if you see them lifting weights. "It has changed the dynamic of what you do in January, and it's changed the dynamic of what you do in December, because now everything is sandwiched into a short period of time. If you play in the SEC championship game, you lose a third of the time you have to recruit in December."